era4You can collect and consolidate data from old legacy applications to the latest in e-business and database systems, in order to make operational data report-ready. Data integration allows users to access, integrate, transform, and distribute enterprise data from any sources for reporting, query and analysis, and performance management. This will ensure your business intelligence users will always be working with up-to-date and meaningful information. 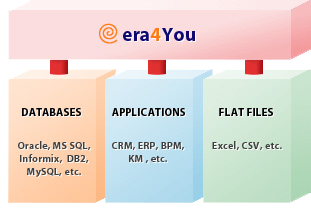 Whether users need to report data from CRM, ERP, KM or other applications, use data stored in industry-leading RDBMS, or use simple flat files, through era4You they can easily extract, transform and load that data into meaningful cubes for multidimensional reporting and analysis. Since the cubes always extract data from live, operational sources, users work with real data to create their reports. Data integration boosts the business intelligence solution deployment time and reduces overall project costs, resulting in increased IT productivity, reducing the application’s total cost of ownership, and maximizing value of investment in enterprise applications.